Me, I’ll be eating my “Prague” and watching. Thanks to All Things Spanking for the link. Hmm. 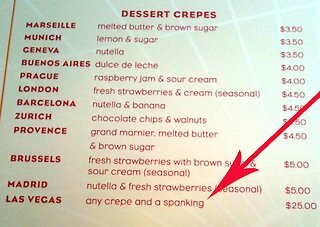 I hate crepes though…How unfortunate. Wow, who knew spanking and being a foodie could come together so well? Thanks for the mention and link, SpankBoss. How about some dessert with the Zurich?